Providing the public with quick easy to access flight information is a prerequisite in today’s age of information. TSI’s Flight Information Display System automatically exports a complete, updated, near-real-time schedule to the Internet. 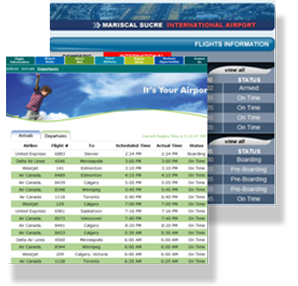 TSI supplies customized web exports designed to match the aesthetics of each airport’s website. TSI’s Flight Information Display System (FIDS) is a complete turn-key, real-time airport information display system. The system supports Gate, Baggage, Ticketing and Multiple Flight Information Displays along with full graphical advertising. The system is designed to be growth oriented solution with a focus on reduction of cost of ownership, automation, maintenance and providing an enhanced level of customer service. Integrated Screen Designer, a tool which allows the airport and/or TSI to create aesthetic custom information screens. Schedules are supported, allowing the airport to alternate pages or create a custom selection of pages/advertisements and announcements. The FID System supports Idle Pages and Idle Schedules; a page or a series of pages displayed on screens during periods where screens are inactive. Fully supports graphical digital advertising. 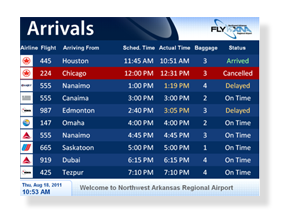 WebFIDS display flight information on websites. FIDS are cell phone friendly supporting live flight information on your cell phone. Video Paging meeting ADA requirements. Supports Automated Flight Updates & Flight Schedules. Innovative Display Drivers designed to operate without failure or local technical support. WEBPORTAL: Access system to make daily flight changes. The web portal provides a real time and future snap shot of current gate and carrousel assignments. 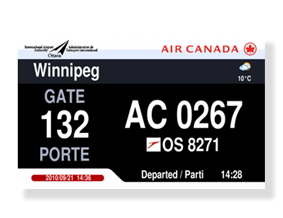 Valuable tool for Airport personnel or duty managers to have a real time Gate Chart at their fingertips. Graphical Monitoring System with advanced diagnostic capabilities displays system operating status in an easy to read graphical format. Fully supports all display device types, LCD’s, Plasmas, LED etc. Fully expandable to grow with your airport’s needs. TSI’s FIDS can be expanded to incorporate the Gate Management System and Airport Operational Database. TSI’s FIDS support many other features to accommodate airport’s needs. Some of these optional features include; Interactive Telephone Flight Information System, Billing Reports, Cell Phone Flight Status Notification, Remote Access Support (TSI can connect to system remotely. ), Automated flight Status Updates and Automated Schedule Updates. TSI's Flight Information is mobile accessible via QR codes that can be scanned with your smart phone.